The underwater kite was included in Time magazine's 50 Best Inventions in 2010. It was also the only invention to make the 2011 list of Top 15 Utility Solutions compiled by the Clean Technology and Sustainable Industries Organization. A Massachusetts research program just got a nice big grant from the National Science Foundation to work on harnessing ocean currents and tidal flows using underwater kites. The potential: Power equal to about 10 nuclear power plants. This kite-flying is being led by David Olinger, an associate professor of mechanical engineering at Worcester Polytechnic Institute specializing in wind and wave turbines. In the past, he and his students developed a very inexpensive kite-powered water pump for developing nations. Now he’s looking to create small tethered, undersea kites that can “fly” quickly in currents. The NSF recently awarded Olinger’s new research program $300,000, WPI reported. This is David Olinger, associate professor of mechanical engineering at Worcester Polytechnic Institute, with a rig that uses a rocking arm to translate the motion of wind-powered kite into rotary motion to spin an electric generator or power a device like a water pump. With an award from the National Science Foundation, Olinger is currently exploring the use of underwater kites to generate power from currents and tidal flows. Olinger cited the Gulf Stream, the massive underwater current flowing from the Gulf of Mexico into the Atlantic Ocean. That power potential is estimated at about 20 gigawatts, or about 10 nuclear power plants. ”Just as wind turbines can convert moving air into electricity, there is the potential to transform these virtually untapped liquid ‘breezes’ into vast amounts of power,” he told WPI. Starting in January, Olinger and his team will begin doing computer modeling to figure out how the kites should be tethered, where to put turbine-generators, what the environmental impacts could be and how to maximize power generation. Finally they’ll build full-scale models to test in large water tanks at WPI and the Alden Research Laboratory nearby. Minesto AB will be testing an underwater kite in the authentic environment outside the coast of Northern Ireland in 2011. Olinger’s system has similarities to the underwater kites designed by the Swedish company Minesto, he told me. 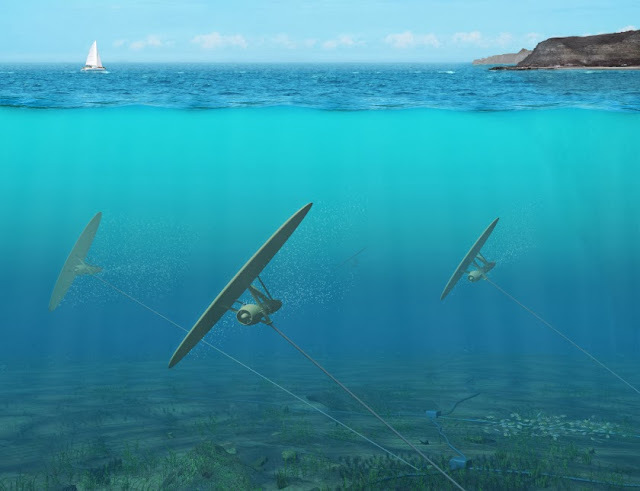 However, Minesto plans to tether the kites to the ocean floor while Olinger’s group would attach them to a floating system. Each Minesto’s kite also has a wind turbine attached while Olinger will look at potentially removing the turbine and placing the electrical generator on the floating platform instead. Flying kites underwater brought Charlie Brown images to mind, but I’m buoyed by the idea that the tech could be nimble, affordable and scalable without requiring ginormous turbines. Plus the kites could be tethered to floating platforms like the ones already used for oil and gas rigs. Just pull them up if they need checking. Then — bam! — they’re back in the sea.